The design by Engineering Institute CIP foresees retaining as much of the old stadium as possible while expanding and modernising it at the same time. 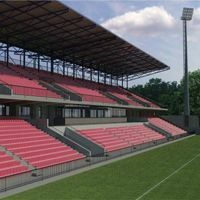 The seating capacity is to grow from 5,000 to 8,000 and a third stand is to be added on the northern side, one to accommodate only 500 corporate viewers and their hospitality building. Apart from the ‘corporate stand’ north, construction in the first phase began on east stand’s expansion. Most of the old land embankment was left untouched, while concrete prefabs were added atop the stand together with partial cover. Last phase is to see the main stand expanded with a second tier and partial reconstruction of the lower one existing today. That part isn’t scheduled yet and has no financing secured so please keep in mind the data presented above is only for the north and east stands. Construction began on November 29 2011 and was supposed to last 270 days. However, in July 2012 general contractors abandoned the site after not being paid. Agreement wasn’t reached until April 2013. After restarting construction was to end in mid-August 2013, but was delayed to 2014.